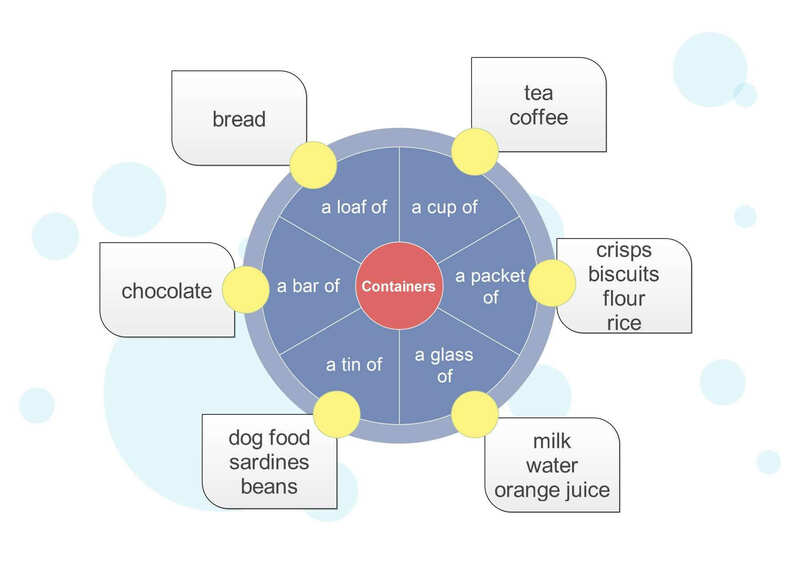 To count uncountable nouns in English students need to know the containers they are most often sold or served in. In the textbook I teach at school I need to teach six of these containers: a loaf, a tin, a packet, a glass, a cup and a bar. In this post you can find a video, an infographic and two games to teach the six containers and their usage. I hope you like the post. Play the following video and let the students repeat the phrases after you. After the first 30 seconds, your students have to say the phrase before it appears on the screen. Play the video at least twice and share the link so that the students can practise the vocabulary at home. After presenting the vocabulary in the video, it is time to present the information in print. The following infographic summs up the containers vocabulary and the food it is most frequently used with. The first game is called Teacher Invaders. In this game you should type the correct container and then you try to shoot all the invaders. The invaders look a lot like the teachers, but we do not mind as long as you learn all the words :-). Good luck. I have already published a post on containers. This post contains more containers than this one. British council has a nice post on containers here.